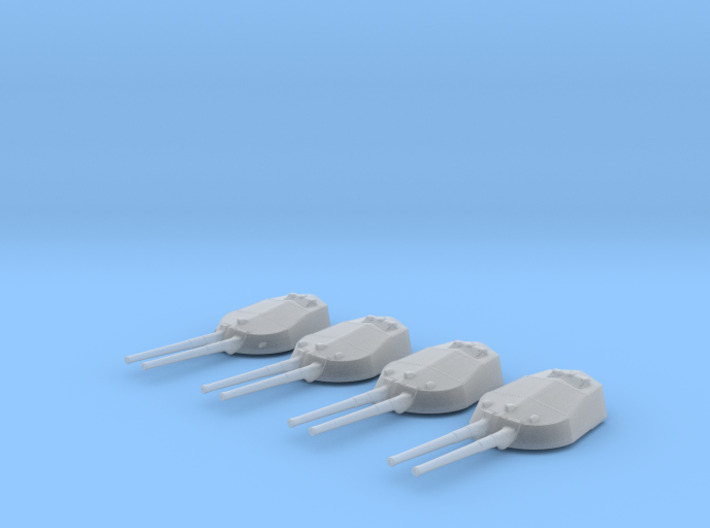 Highly detailed 1/600 Scale HMS Tiger 13.5" MKV Turret set (4). 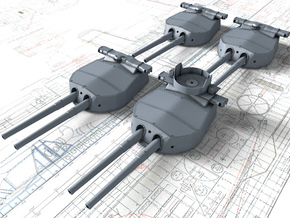 These are highly detailed parts anyone wishing to scratch build the HMS Tiger, each turret is modelled from the John Roberts HMS Queen Mary plans and also many reference photographs. 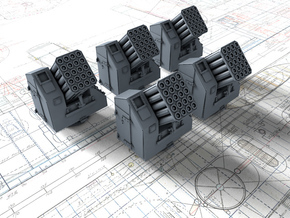 Barrels are printed in place at 2º degree elevation with digitally hand sculpted Blast Bags. Note: Turret A has sighting ports located on the face of the turret, this was unique to HMS Tiger. Thank you to Mr N. Taylor for invaluable reference. Accurate armour thickness on all faces. Officially designated as the 12-in 'A' to conceal the increase in caliber size from the 12"/50 (30.5 cm) guns used on previous ships, this was the largest dreadnought battleship gun in the world at the time of its introduction. A Vickers design, these guns are sometimes suffixed as Mark V(L) and Mark V(H), which signifies the weight of the projectiles fired. See below for further details. The failure of the high-velocity 12"/50 (30.5 cm) Mark XI led to a reconsideration of how to achieve an increase in the destructive power of naval guns. 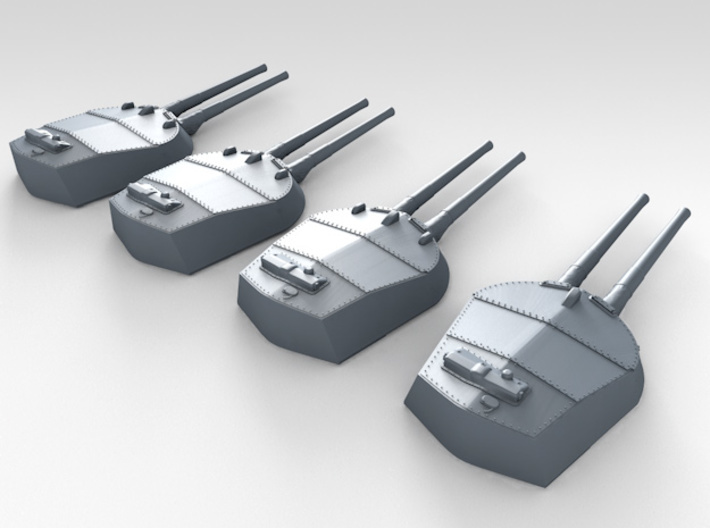 As a result, instead of simply raising the muzzle velocity as had been done in the past, the Admiralty now decided to maximize the weight of the projectiles by increasing the gun caliber. 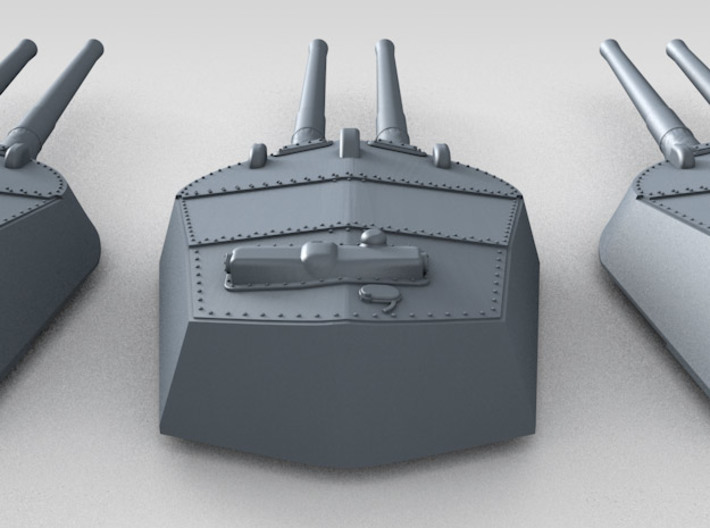 In October 1908 the Admiralty requested Vickers to quote on new designs for 13" (33 cm), 13.5" (34.3 cm) and 14" (35.6 cm) guns. Part of the design requirements for these weapons was that their projectiles were to have the same nominal residual velocity of 1,640 fps (500 mps) at 8,000 yards (7,320 m) as did projectiles from the 12"/45 (30.5 cm) Mark X. The 13.5" (34.3 cm) design was selected in January 1909 and the first prototype was fired at Shoeburyness late that same year. The greater momentum inherent in a heavier projectile means that it does not loose its velocity as quickly as does a lighter projectile. So, although the muzzle velocity of the 13.5" (34.3 cm) gun was equal to that of the 12"/45 (30.5 cm) Mark X and less than that of the 12"/50 (30.5 cm) Mark XI, the striking velocity and penetration power of the new gun at long ranges was much greater than that of either of the two smaller guns. HMS Orion was the first ship armed with these weapons and was the first British dreadnought with all mountings on the centerline and with superfiring turrets fitted on the bow. 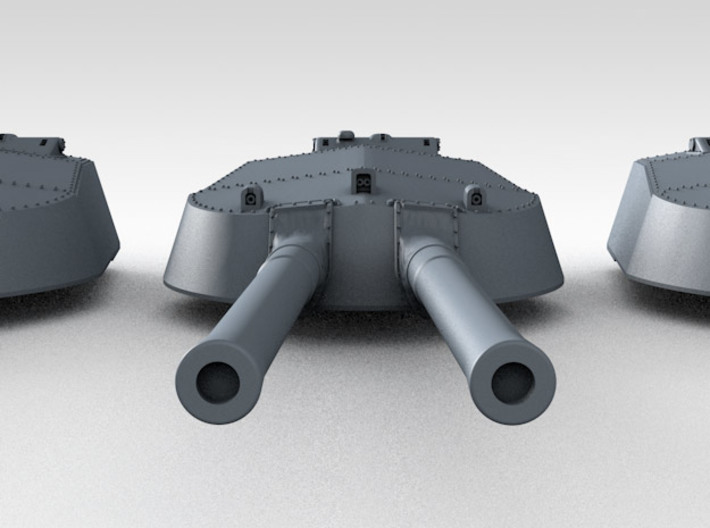 These new 13.5" (34.3 cm) guns were found to be very reliable and accurate in service with exceptionally low barrel wear. 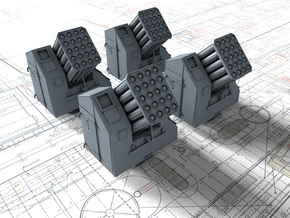 As the design had been given a considerable safety margin, it was decided that later ships could use a heavier shell to increase their hitting power still further. No changes were made to the guns themselves to fire the heavier projectiles, the changes were limited to the shell handling equipment and hoists in the mountings. 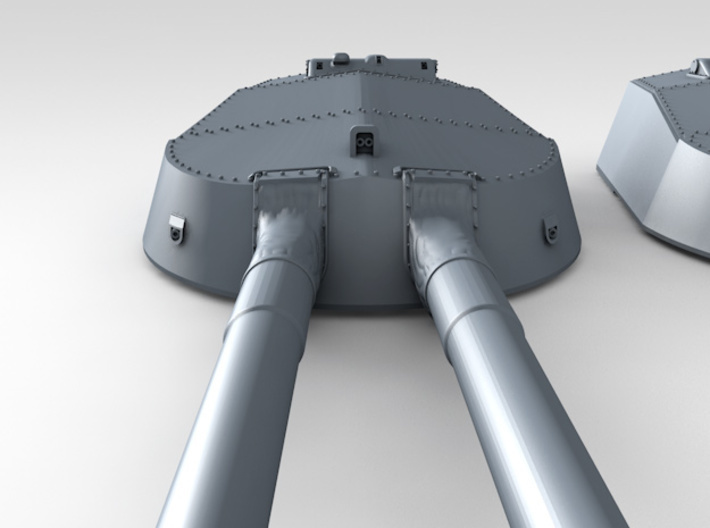 Although these guns had a maximum elevation of 20 degrees, as built the prisms in the director and turret sights were only good to slightly over 15 degrees. This was because prior to World War I it was expected that battles would be fought at relatively short ranges and thus the advantages of firing beyond 15,000 yards (13,700 m) were not appreciated. 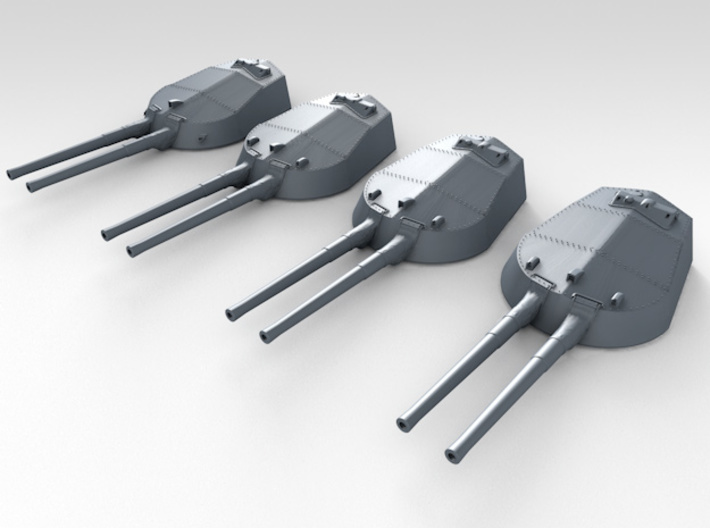 Auxiliary prisms that could be attached to the existing sights and which gave an extra 6 degrees of elevation were produced during World War I, but many ships still lacked these as late as the Battle of Jutland (Skagerrak). At Dogger Bank two 13.5" (34.3 cm) APC projectiles hit German armor of 30 cm (12") without penetrating. A third shell of this caliber hit Seydlitz on her 23 cm (9") barbette armor at an angle of 33 degrees to the normal. Although this burst without any splinters entering the ship, flash and spalled armor fragments ignited 62 propellant charges and this fire burned out both stern turrets, killing 165 crewmen. Seydlitz was hit again by a 13.5" (34.3 cm) projectile almost the same way during the Battle of Jutland (Skagerrak) and this again holed the armor but was kept out except for flash which ignited four charges. During World War II three of these guns were used as railway artillery in the Dover area and were supplied with super charges. A further three guns were relined to 8" (20.3 cm) as a "not very successful super-velocity gun - a remarkable waste of effort" (John Campbell). 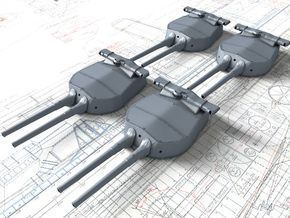 Four guns together with their slides and cradles from the scrapped battlecruiser HMS Tiger were sold to Turkey before the start of World War II, but none were ever delivered. The "steel choke" problem first found on the 12"/35 (30.5 cm) Mark VIII was finally fixed in the later models of these guns by the introduction of a slow taper fit between the inner A and A tubes. The locating shoulders, which in the earlier guns were well forward and overly concentrated longitudinal stress towards the muzzle, were moved well back in the new guns. These guns were of the standard wire-wound construction and the first 67 of the 206 guns produced still had the forward locating shoulders and lacked the taper fit. 54 guns were still in existence in 1939 along with six turrets removed from HMS Tiger and HMS Iron Duke which had been placed in storage at Rosyth.